Seth is new to the StencilGirl Family and recently released his first three stencils with StencilGirl! You can find out more about Seth on our website. Join us as we hop along and see how the different artist's (including Seth) used the stencils! You never know what fun you will find along the way! Make sure you leave a comment on this blog and ALL the other blogs in the hop because we are giving away Seth's stencils and EVERY comment in the hop is eligible to win! Just leave a comment and be eligible to win. What are we GIVING AWAY??!! One of each of Seth's Stencils. We will pick THREE winners and each will receive ONE (our choice) of Seth's designs. Good Luck!!! Giveaway closes at 11:59 PM Central Time on Sunday, September 15th! Yahoo! I've been ogling Seth's stencils. Love Seth AND his stencils. Maybe I'll have one soon....or some other lucky person. Count me in!! Love Seth's stencils! I am so excited to see what everyone has done with Seth's stencils! They offer so many possibilities. Thanks! I would love to win one of Seth's stencils - he has such a wonderful artsy style! Thanks for a chance to win one of Seth's stencils! Love the artful possibilities! very cool stencils! But I'd expect nothing less from Seth. He's a cool guy! great giveaway these stencils are awesome! Fantastic stencils, I would love to have the unfinished one painted on a t.shirt! I love the stencils. Thanks so much for the giveaway! Love the stencils. Looking forward to seeing the other hops. I love these stencils. They are so versatile. Seth Apter is such an inspiration - I have all his books and adore his blog. He has really made a difference in getting me to create while ignoring the inner critic. The stencils look fantastic!!! Thanks for a fabulous giveaway - I especially like the numbers stencil! Seth is amazing and his stencils are awesome! Thanks for a chance to win one! these are such FABULOUS stencils-wow!! !Would LOVE to win one! Your choice of a stencil would be great! They are all FABULOUS! Off to check the blogs! These stencils are great. Lots of sections to use in art journals. I love them all. Another fabulous HOP!!! I love seeing how you all use these stencils! So many techniques that I would have never thought of or even tried until now! Thanks so much for inspiration & of course, the opportunity to win!! Happy weekend to y'all! Hi. Love to see the different interpretations of the stencils that you all come up with.Keep up the good work. I am in love with the versatility of this stencil. Love the blog hops for all the inspiration! 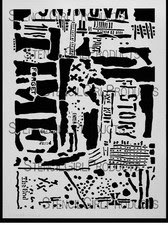 These are fabulous stencils! I know, because I bought them from Seth himself at Create in NJ. I'm gonna hop along, but please, if I win, choose someone else so they can enjoy them too! Very cool stencils!!!! Thanks for the chance to win one!! Ab Fab.....would love to win any one of them. Ahhhh, can't wait to see what marvelous art awaits me. Great stencils. Have been reading Seth's blog for a while. The stencils are already on my wish list. VERY cool stencils, Mr. Apter! I love the stencils. Thank you for the chance! These stencils look great, the possibilities would be endless with them. Thanks for the chance to win. Love ALL the stencil girl stencils! Love Seth's stencils too! Y'all are amazing at finding so many different artists to make these amazing stencils! thanks for the chance to win stencils!!! LOVE THEM!!! I love all 3 of Seth's stencil designs. Blessings! Seth is so creative! Love his work! I love Seth's work and these stencils ROCK!! So different than what is out there. Thanks for a chance to win one of Seth's stencils. I took a class from him in Maryland at the Queen's Ink. He is a great workshop teacher. I enjoyed the workshop so much and would love to win one of his stencils. Love these stencils! Thanks for a chance to win! I love Seth's stencils...they are jam packed with inspiration! Love you, love your work! Thank you for the opportunity! Love the stencils! I would love to win! I love the stencils... they stir my inspiration. Thanks for hosting a fun blog hop, and a giveaway! Really like these stencils. map like, text like. Can see lots of possibilities. thanks for chance to win. Ready! Go for another blog hop! Cool! Very fun hop! So many wonderful art pieces to look at! Thanks for the hop and the giveaway! These stencils are SO great! Thanks for the opportunity to win one. Love seeing what others have created with them. Love to hop and love these stencils! Wow.....terrific stencils. How fun it would be to play with one of these!! Fab designs from Seth! Thanks for a chance to win. I think I missed this at the beginning so completing the circle. So many talented people. I think you did a great job with these stencils. Bringing them to the public in such a fun way makes them that much more desirable. I have no idea what I would create with them, but I don't doubt that an idea, or twelve, would manifest. With all the great potential in each stencil I'd have so much fun! Thanks for gifting to the community. 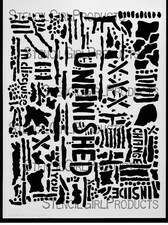 Have been eyeing up these stencils, added them to my Christmas wish list! But it would be so brill to win one! these will be great for texture. all of them. Thanks for a chance to win one. I LOVE these stencils! Having so much fun learning to use them and about Mixed Media! More fabulous stencils from StencilGirl...congrats to you & Seth! Seth's stencils are FABulous! Thanks for this opportunity to win one! Awesome stencils! And I love blog hops - it's such a great way to get to meet new artists and get a lot of inspiration. 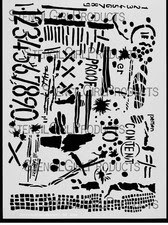 Seth's stencils are a great addition to your stencil collection. Thanks for hosting a giveaway! Great stencils! I can already imagine many uses...keep on with your creativity! I hope I win. I'm just getting back into altered art and could use some new supplies! Woop Woop LOVE LOVE these stencils!!!! You Rock!!!! gotta have these.. I am convinced I need to subscribe next month! Love these Seth! they are right up my alley! Oh my, the competition is fierce! Everyone wants one of Seth's stencils!!! May whom ever wins make wonderful art with these fantastic stencils! Found Seth and his Mixed Media Art a few days ago and love it. To see his stencils here is great! Wow those are stunning, would be perfect for my journal pages. Love Seth's new stencil. Will have to get or better yet be one of the winners. Love the new stencil! Thanks for sharing all these wonderful blogs! What an inspiring Sunday morning! Love the stencils, I'm having a stencil emergency and need them badly. love this whole project and all the participating artists using Seth's wonderful stencils!! Interesting stencils - does this mean Stencil Girls is changing their name? I love these stencils! I hope I win, that would be awesome!! What crazy fabulous stencils! There are so many options to use them!!!! Very unique stencils, never saw any like these! Your stencils are amazing! Thanks for hosting a hop! At first, I wasn't sure I like these stencils because there is a certain chaos. After all these wonderful projects, I have to have them. i feel so foolish I found heaps of stencils cheap ones and gave them all away.. I had no idea the things you could do with them.. Well done on creating such amazing stencils and also giving us great ideas on how to use them..